New arrival: Garmin Forerunner 645 Music GPS smart watch « Tech bytes for tea? The Garmin Forerunner 645 Music is a GPS running watch with integrated music and features Garmin Pay contactless payment solution. RRP: S$669 (without integrated music: S$599). IT Show 2018 promotions below. Garmin Forerunner 645 Music & Forerunner 645 GPS smart watch. The integrated music gives athletes the freedom to enjoy their favorite tunes on a run or during a workout without having to take a phone along. The Forerunner 645 Music is available with a black or cerise band and has a suggested retail price of S$669. An option without integrated music capabilities – the Forerunner 645 – is available with a black or sandstone band with a suggested retail price of S$599. Need to buy a bottle of water or a quick bite after a workout? Garmin Pay contactless payment solution lets users pay for purchases with the Forerunner 645 Music. In addition to 24/7 heart rate monitoring, the smart watch includes advanced running dynamics, performance monitoring tools, connected features and thousands of ways to customise with free watch faces, widgets, data fields and apps through the Garmin Connect IQ store. The Forerunner 645 Music has a sporty style, with a metal bezel, chemically strengthened glass and interchangeable bands. Both variations will be available for pre-order at all Garmin booths at the IT Show 2018 from 15 to 18 March at Suntec Singapore Level 3. The first 30 customers each day who pre-order the Forerunner 645 Music will get a free Jaybird X3 Bluetooth Headphones worth S$215 and a S$20 CapitaVoucher for pre-orders of the Forerunner 645. It can store up to 500 songs on the device itself – download offline playlists from select music streaming services, or transfer music from a computer directly to the watch. Once the playlist is loaded, pair the Forerunner 645 Music with a set of compatible Bluetooth® headphones (sold separately). Garmin Pay is a contactless payment solution that uses your Garmin Pay wallet to enjoy the same rewards and benefits of physical cards. Athletes can better prepare for a race or training cycle with the help of training features provided by Firstbeat. Training status automatically evaluates previous exercise and fitness levels to let athletes know if they are training productively, peaking or overreaching. “Listening to music helps most of us keep our momentum going during those long or particularly difficult runs. 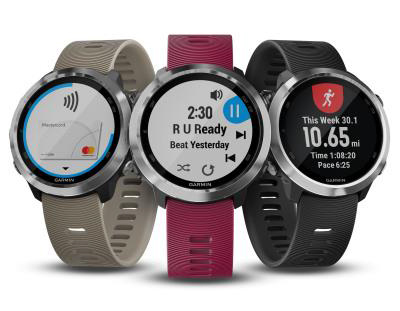 Now, with the addition of integrated music and Garmin Pay, the Forerunner 645 Music will help give athletes the independence they’ve been looking for while still providing them with the quality and accuracy of our other running products that they have come to rely on,” said Mr. Engelhard (Al) Sundoro, Managing Director, Garmin South Asia. Measuring exercise volume from the last seven days, training load helps users determine if they are training in the right zone and whether their sessions are too easy or hard. Additionally, the anaerobic training effect metric will tell athletes how their hard work and training is improving their ability to push the limits. The Forerunner 645 Music allows athletes to go even further with their running data. Clipping the Running Dynamics Pod to the waistband allows users to see all six running dynamics, including cadence, ground contact time, stride length and more on their watch without the need for a chest strap. Built-in GPS and GLONASS let athletes track how far, how fast and where they run – no phone connection required. Go for a ride, swim, walk and more to take advantage of even more features available on the Forerunner 645 Music. Furthermore, users can view and follow downloaded courses on their wrist, race a previous activity and train with simple intervals or follow complex workouts. In the pool, the Forerunner 645 Music will track distance, pace, stroke, personal records and more. With an array of connected features, the Forerunner 645 Music lets users stay in touch with the rest of the world, even while on the move. When paired with a compatible smartphone, it automatically uploads to Garmin Connect™, an online fitness community where users can track workouts, sleep patterns, join online challenges to compete against friends and earn virtual badges. Directly from the wrist, users will be able to receive and respond to text messages, invite friends to follow their runs in real time with LiveTrack, and view social media updates, emails and more. The Forerunner 645 Music features up to seven days of battery life in smartwatch mode and up to five hours in GPS mode with music. Weighing roughly 42 grams, this is the first Forerunner to feature a stainless-steel metal bezel and always-on Garmin Chroma Display™ that is easy to read — even in direct sunlight — and is housed under chemically strengthened glass. When you want to change it up, swapping bands is fast and does not require the use of any tools. It also features a reliable five-button interface that allows users to mark laps with a quick press. This entry was posted on Tuesday, March 13th, 2018 at 6:16 pm and is filed under Accessories, Announce, fitness watches, Gadgets, gadgets, Launch, newArrivals, Press Release, Prices, Promotions, Specifications, Sports, Watches. You can follow any responses to this entry through the RSS 2.0 feed. You can leave a response, or trackback from your own site.